Today I have an interview with Paul Mitchener and Ryan Danks on their new RPG Age of Anarchy, which is currently on Kickstarter! It sounds pretty cool, and I hope you all enjoy hearing about it! Tell me a little about Age of Anarchy. What excites you about it? 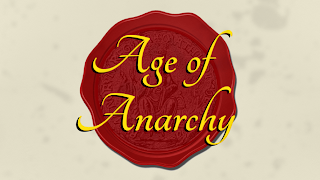 Paul: Age of Anarchy is a game set in Norman England, during a twenty year period of uncertainty and civil war, when King Stephen and the Empress Matilda both claim the throne. It's based on player characters serving a patron- a feudal lord or lady- struggling to survive and better their status and influence amidst the strife. I'm excited by the patron idea, where the players jointly create their lord, and each contribute with issues. These issues generate adventures, and the success or failure of these determines whether the patron rises or falls in status. I'm also, if I may have two things, excited by the time period. There are so many cool events, betrayals and alliances. In my current game, the Anarchy has turned into actual war when the player characters worked to free bishops, who King Stephen imprisoned when he feared they opposed him and were fortifying. Ryan: What excites me is the system (PME), but that's the part I worked on. :) The Perpetual Motion Engine was developed from the ground up to make our core concept function: that the player characters serve a cause or Patron, with the goal of taking that cause to the heights of power and influence. Paul had the idea to place the system's first run in The Anarchy, a period of Norman English civil war, and it worked perfectly! But I'm most excited about the system we created and to be able to play with it in the future. Can you tell me about the patron creation, and how it influences the characters and story? Paul: Patron creation is a major part of the game. The characters all work for the Patron, and the group works together to create issues for the Patron. At the start of a game session, the players choose an issue for the scenario. Success or failure in addressing an issue governs whether the Patron the patron rises in status or falls, and player character advancement. Further, an unaddressed issue can "explode" and create problems along with a loss of status. Ryan: The patron system is my favorite part of PME. Everyone at the table makes the patron, signaling what kind of game they want to play by the issues they give to the patron. Then, players get to choose what kind of adventure they want by telling the GM which issue they want to try and resolve. It brings out the shared storytelling experience that I'm so big on. 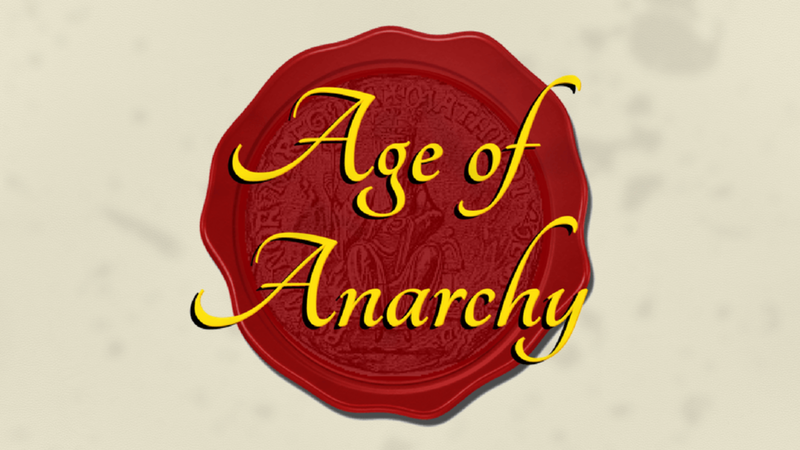 Are you making any efforts to make Age of Anarchy inclusive, especially considering the time period in question? Paul: Right, this is important. Norman England was undeniably patriarchal. But of the two contenders for the crown, the Empress Matilda, the one King Henry named as his heir, is of course a women. And other women are influential during the Anarchy; for example, Queen Maud at one stage leads forces to rescue her husband King Stephen from imprisonment. In terms of player characters, nobles, merchants, outlaws, and scholars are all possible, and these are not gendered roles. Female warriors will be rare in the era, but "rare" is certainly no obstacle when it comes to player characters. This diversity is reflected in both characters within the game book, and in the art. Ryan: We are making an effort. In fact, we're only spending money on art for this reason. There is plenty of royalty-free art about the time period that we can use for the game, and we fully intend on doing so. There are some great paintings out there. But in an effort to be inclusive, we're going to add in stock photos that are rendered in a painting style. Fact is, there isn't a lot of diversity in ancient paintings, but there are a lot of models on Adobe Stock that help us make create a more diverse feel for our game. Tell me a little about the Perpetual Motion Engine (PME). How does it work? What do the mechanics "do"? Paul: The Perpetual Motion is simple at its base: players roll, add a skill, try to hit a target number based on the challenge level of an opponent or obstacle. Failure means there's a complication or something goes wrong, and is not typically just a straight "no". Degree of success reflects how good or bad things are, and you might have assets coming from your patron which give leverage (boosting the degree of success for certain checks if you succeed). Social conflicts and combat are on the same footing, and both can be handled with either a single roll or a series of actions where everyone is involved. The philosophy is to enable play without having to do much preparation for a session and to keep things moving avoiding "dead" space and dice rolls where nothing happens. There are instructions on how to quickly structure a mission coming from an issue to enable this. Ryan: In a nutshell, you roll 2d6 vs. a target number (or 1d6 vs. 1d6). If you succeed, then you get what you want, which may include a complication for the scene or setting. If you fail, you suffer a complication. There are modifiers, numerical damage (a form of complication), etc., but that's the core of it. Fans of Fate Core and Apocalypse World are going to love it, as it's sort of a combination of the two methods. What kind of adventures will players have in Age of Anarchy? What challenges might they face, and what rewards might they receive? Paul: Player characters go on missions for their patron to deal with their issues. Examples in my game were to gather support and convince a stubborn earl to support Queen Matilda and stop thinking of the patron as a traitor and dealing with a land dispute from a local abbey whose corrupt abbot had hired local ruffians to seize control of a local village. For me, it's been political intrigue punctuated by outbreaks of violence. Character issues can complicate missions. For example, one of the characters in my game has a dispute with a powerful earl who holds his family lands, and claims the character has debts to him. In terms of rewards, characters both advance on their own and receive assets when a patron advances. The real object of the game is to advance the patron's cause, and in so doing rise with them. It actually has an end point, when the patron has risen to a position of unassailable influence or falls so badly in status they lose everything. Ryan: The adventures and challenges are based on the patron they create. If their patron is a merchant, then PCs may face thieves, competitors, shipment negotiations, etc. If the patron is a knight, then PCs may fight off brigands, face the opposing faction in battle, or parley in court. The rewards players receive come in the form of paths and assets. Paths are abilities the players earn as they level, and assets are gear and allies the players gain access to as the patron levels up. Also, there's the game not ending when the patron falls too low in influence. I'm pretty sure that qualifies as a reward, too. Awesome! Thanks to Paul and Ryan for the interview! Take a look at the Kickstarter if Age of Anarchy sounds like your thing, and please share!